When the crowds heard [Jesus say that living water will flow from his heart], some of them declared, "Surely this man is the Prophet we've been expecting." Others said, "He is the Messiah." Still others said, "But he can't be! Will the Messiah come from Galilee? For the Scriptures clearly state that the Messiah will be born of the royal line of David, in Bethlehem, the village where King David was born." So the crowd was divided about him. Some even wanted him arrested, but no one laid a hand on him. 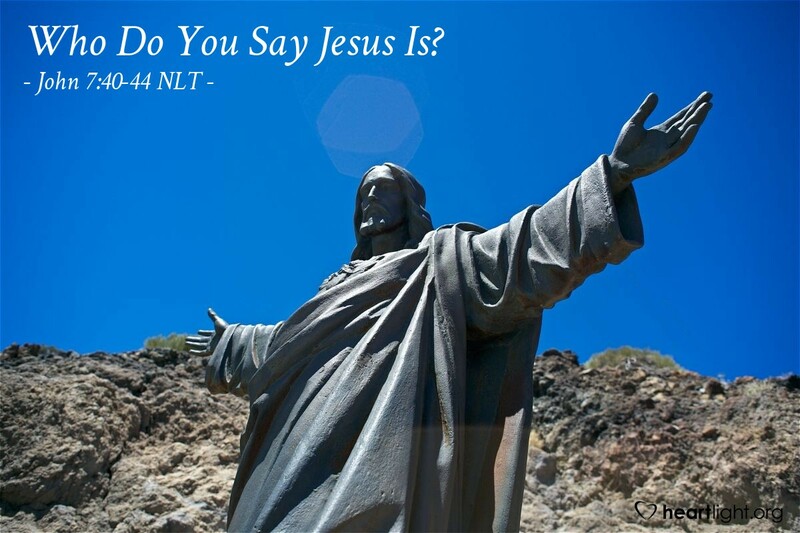 Who do you say Jesus is? Is he prophet, king, teacher, messiah, lord, master, imposter, pretender, fake, charlatan, deceiver? So often some people make their decisions about Jesus based on improper information. They think they know about him because they have heard about him at a church or read about him in a magazine or have been told by someone else. The real issue, however, is whether or not each of us has personally gone on a quest to discover Jesus. As you read the Gospel of John this year, also try to read the other three Gospels (Matthew, Mark, and Luke). Ask God to help you know Jesus for who he really is. The most important question any of us will ever answer is this: "Who do I say Jesus is?" O God, Almighty and Everlasting, please reveal Jesus to me so that I can know him personally and follow him passionately. I don't want to know him just by reputation or report but from personal knowledge and experience. Please reveal your Son to me and in me as I seek to know him better. It is in his name, Jesus the Christ, that I pray. Amen.